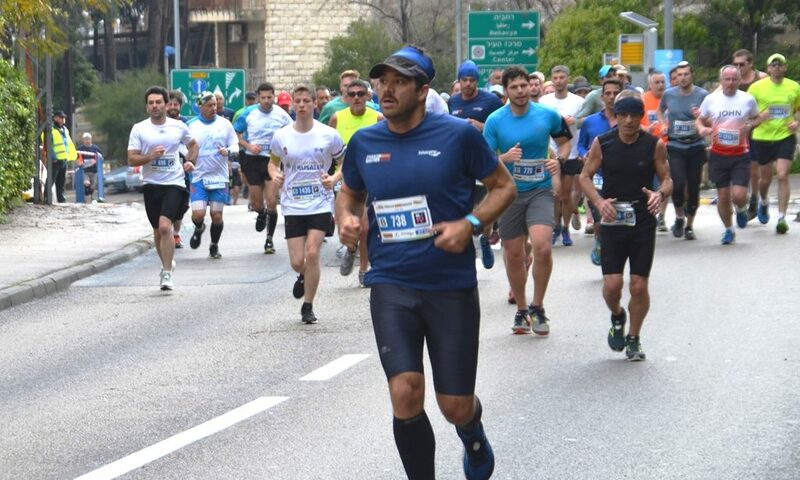 Early Friday morning on March 15, 2019, 40,000 runners filled the Jerusalem, Israel, streets for the 9th International Jerusalem Winner Marathon. 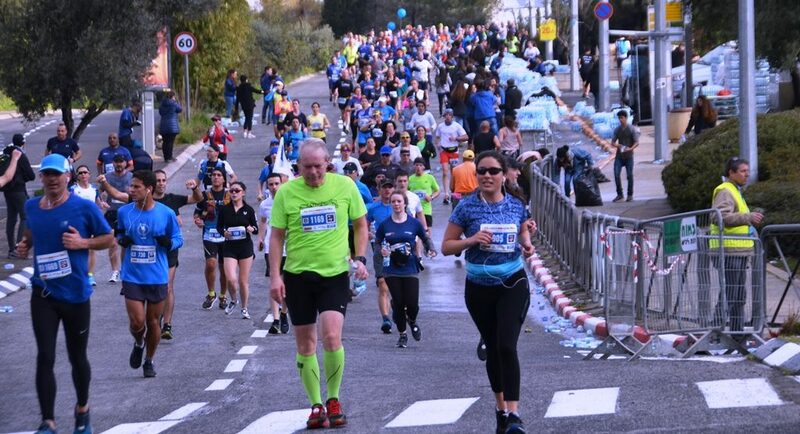 Thousands from around the world came to run in the full marathon and other races. 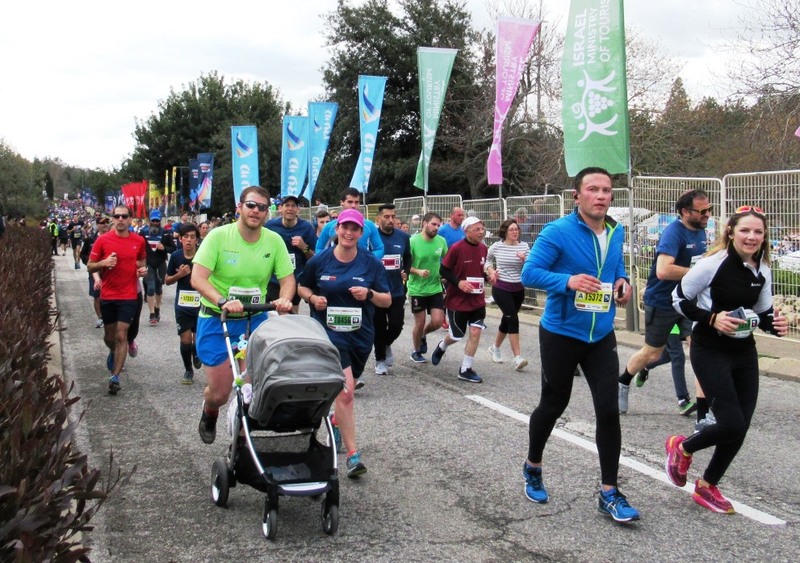 Streets were closed for these athletes with blue tags for full marathon. 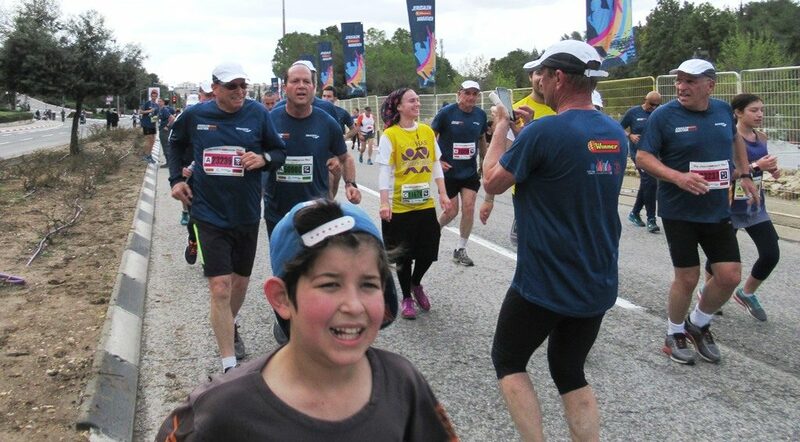 The full Jerusalem marathon runners seemed to keep coming. 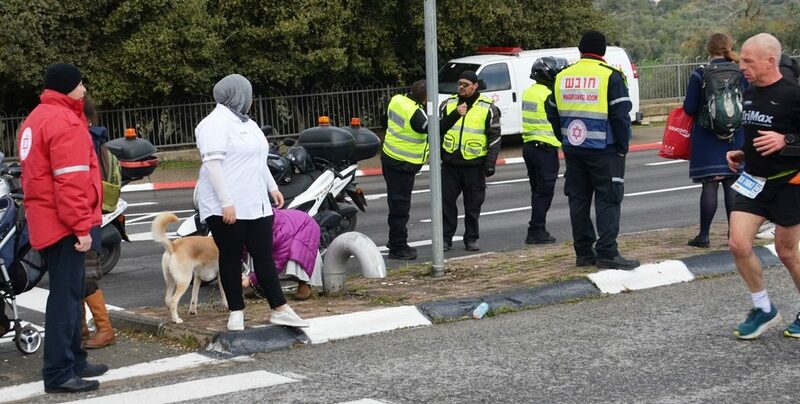 Emergency teams were in place, but I did not hear any reports of serious injury. Some of the runners dressed up as superheroes. Oops, this motorcycle lead for the half marathon first place went by so quickly. I missed him coming, and only got a shot after he whizzed past. 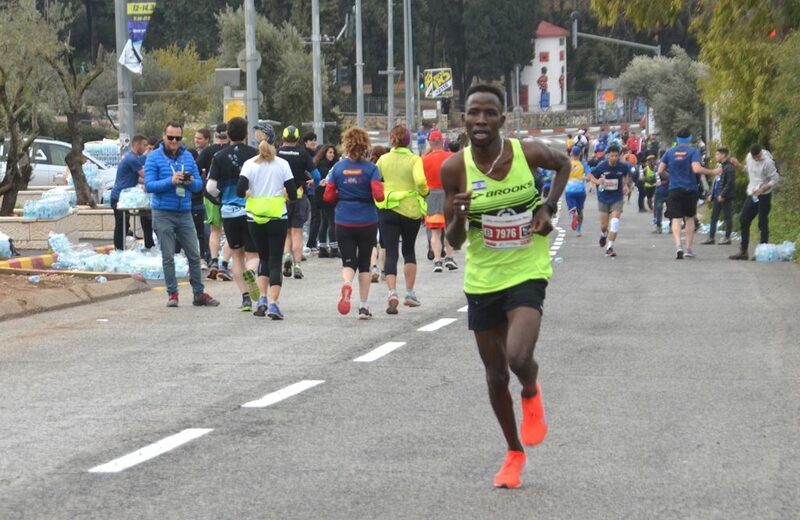 But second place was not far behind and here he is coming into the home stretch. This year I decided to take fewer photos, so I missed the rest of the half marathon runners. International media covered the event, here is one doing an interview in Arabic. 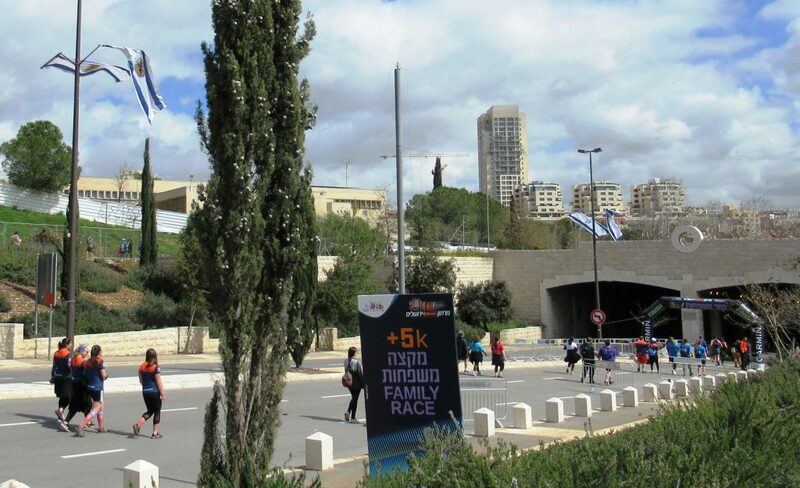 The flags of the eighty participating countries are flying along the route to starting line. This year for the first time there was a Syrian flag. 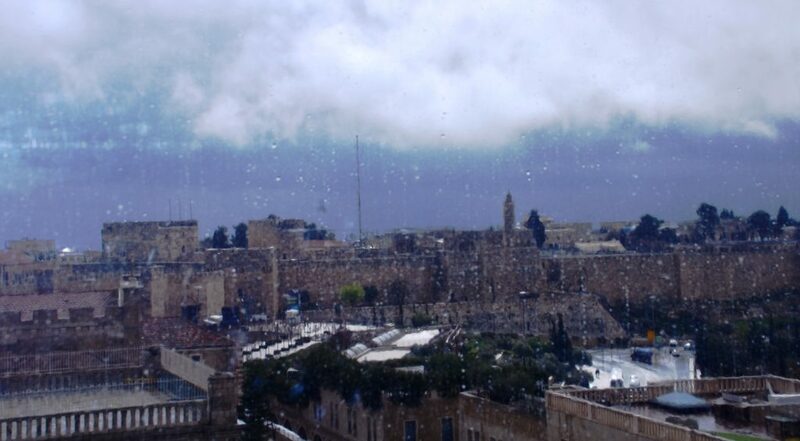 Heavy rains the day before of the marathon blocked view of Jaffa Gate. 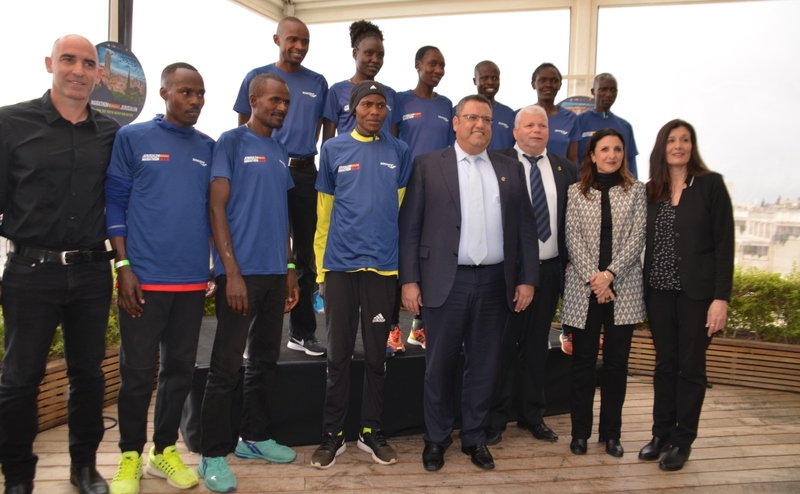 Mayor Moshe Lion and dignitaries had to pose inside with elite runners. Gan Sacher, Sacher Park, was one big mud patch, but the sun was shining and temperature cool and pleasant for the races. Key areas were covered, like this area near the stage where the first place medals were awarded. 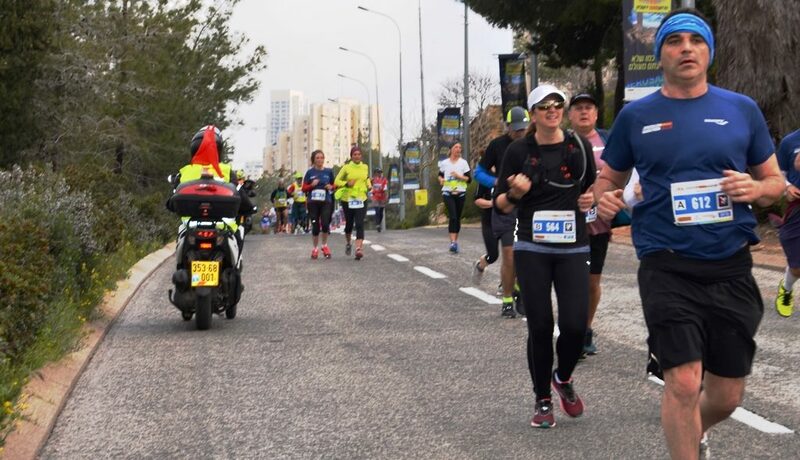 The Jerusalem Marathon is always more than a competition for the fastest running. 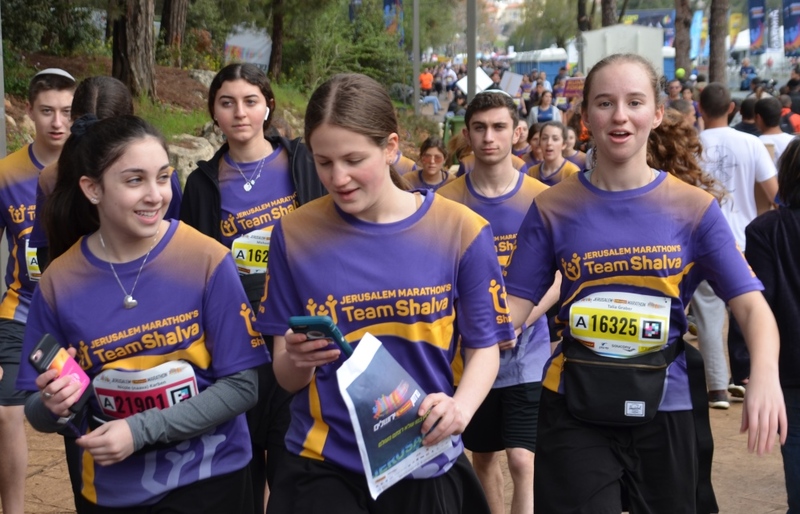 Team Shalva had teen participants from US schools, among its hundreds of supporters. 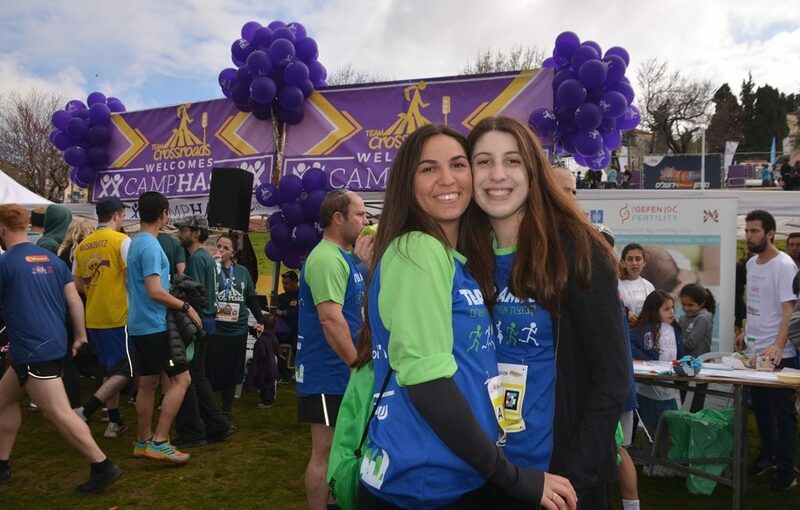 Shalva raises large sums each year from this event. Other nonprofits and charities had teams and booths in the park. 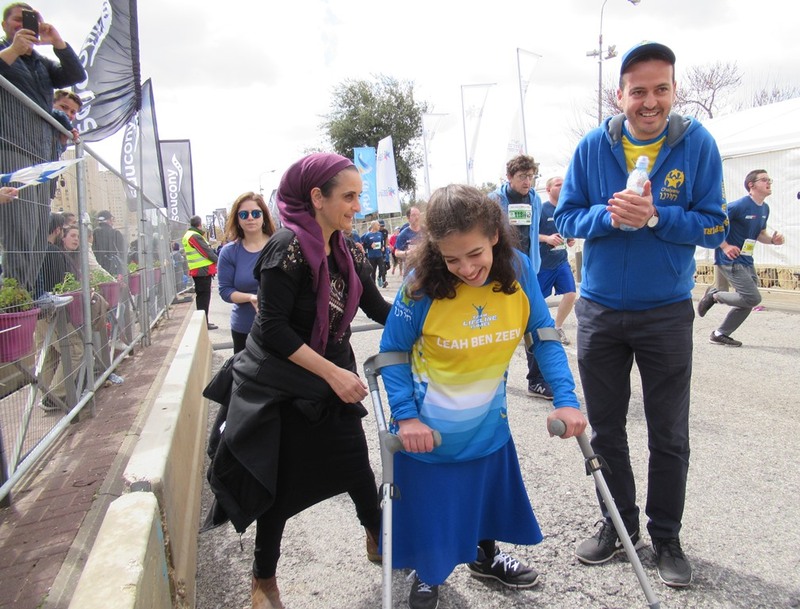 Teams from Camp HASC and AMIT, and over 100 good causes, come year after year. 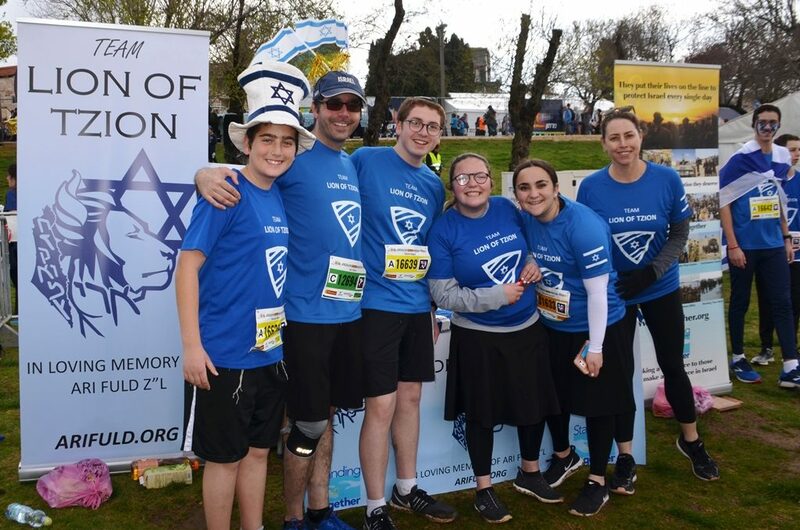 One new team this year was Lion of Tzion. 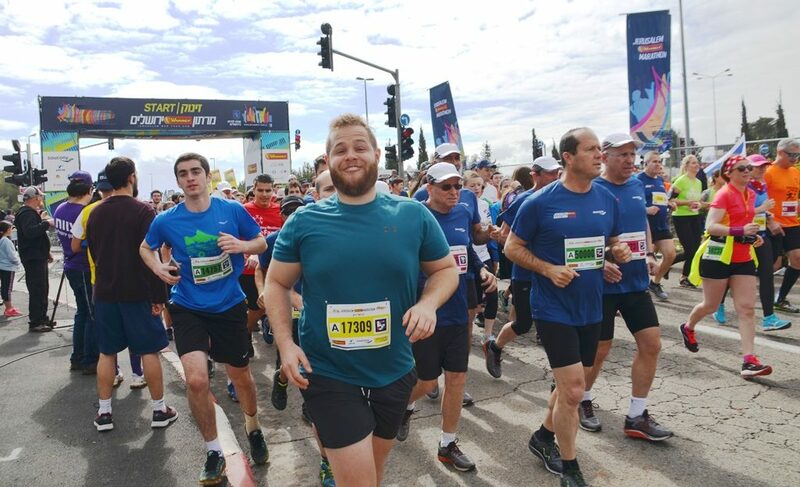 These young people organized to run to raise money to buy a food truck in memory of Ari Fuld z”l to take food and treats to IDF soldiers. 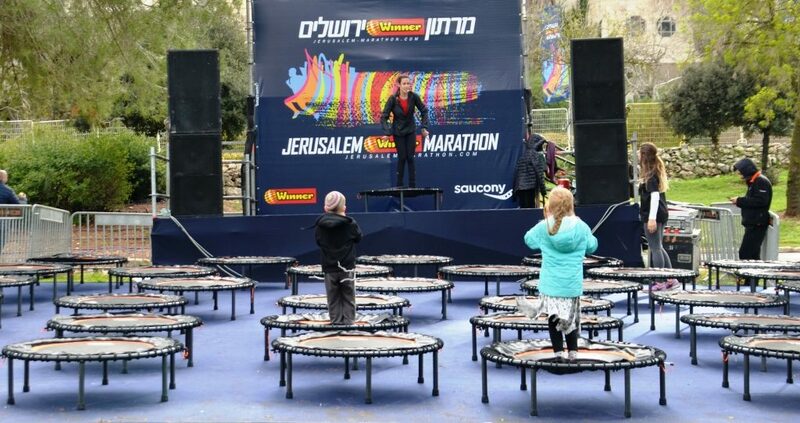 Trampolines were set up in the park as one of the activities for families, and at an early hour it was not crowded. 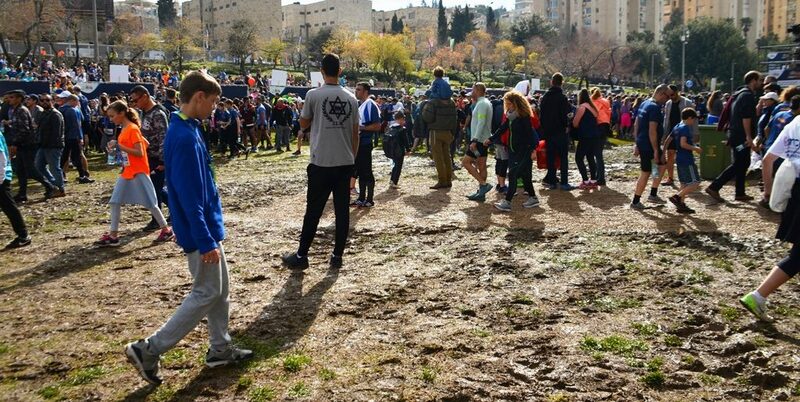 But in spite of weather the day before, and in spite of the mud in the park, runners and their supporters came. For the new ninja, there was a long line waiting for a turn. 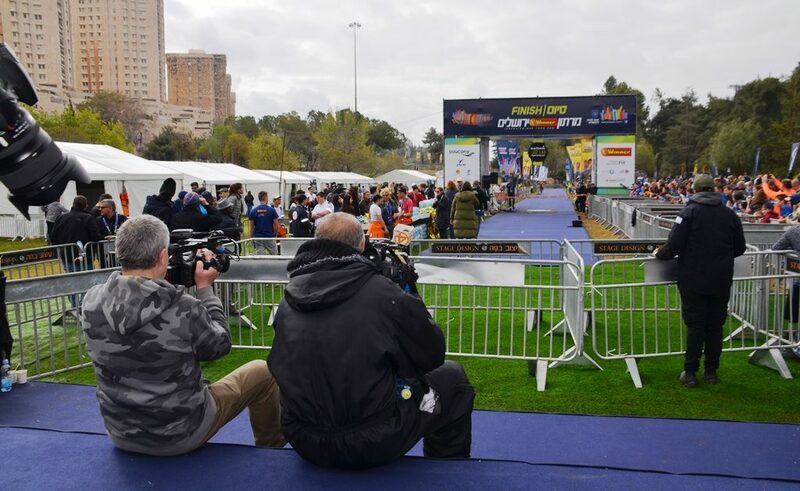 Media was waiting for the full marathon winner to arrive and cross the finish line. while the long list of other races end at the other locations outside of the park. This was the crowd waiting to greet the marathon winner. 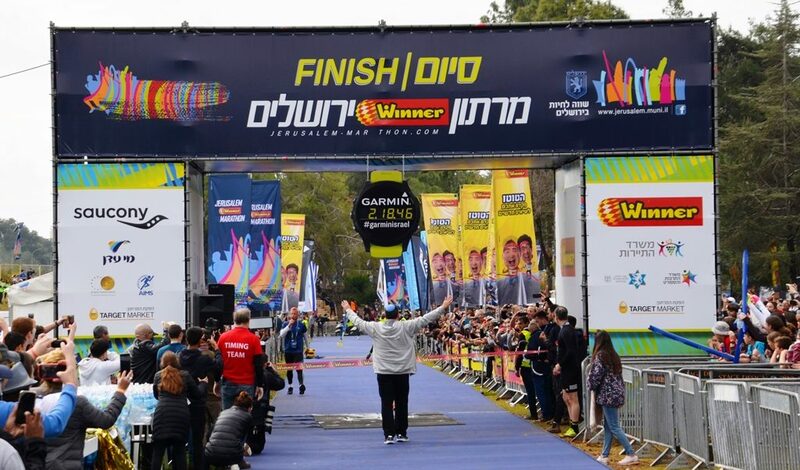 New Jerusalem Mayor Moshe Lion was ready at the finish line for a photo op. Mayor Lion stood waiting for the winner, front and center. So center, with the medal in his hand, the mayor blocked my view of both the first and second place finishers. 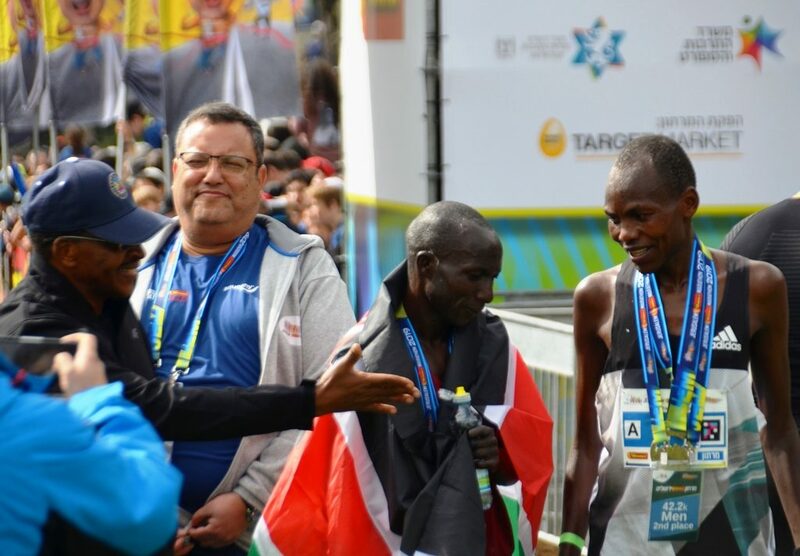 All the first place runners were from Kenya this year. But there was more action at the starting lines and the other finish lines. 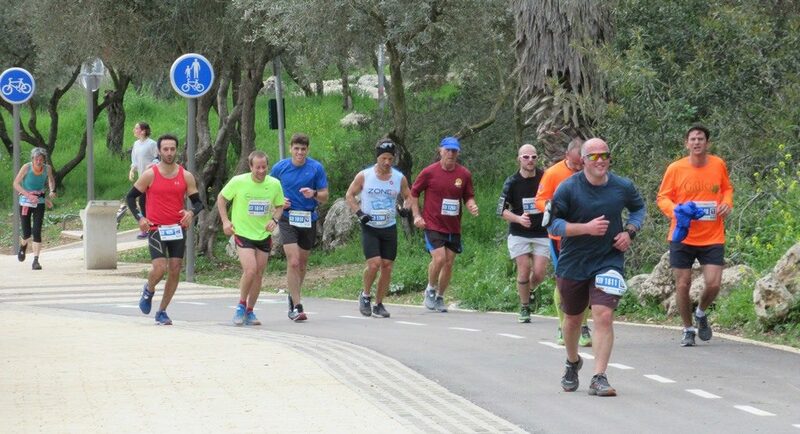 The starting line was out of the park and up the hill toward the Israel Museum and Knesset. At the various starts there was a burst of energy and excitement. For years I tried to get a photo of former Mayor Nir Barkat. This year I did not try and there he was with the green tag to the right. So many smiles and such excitement, this woman was with a group from Hong Kong. 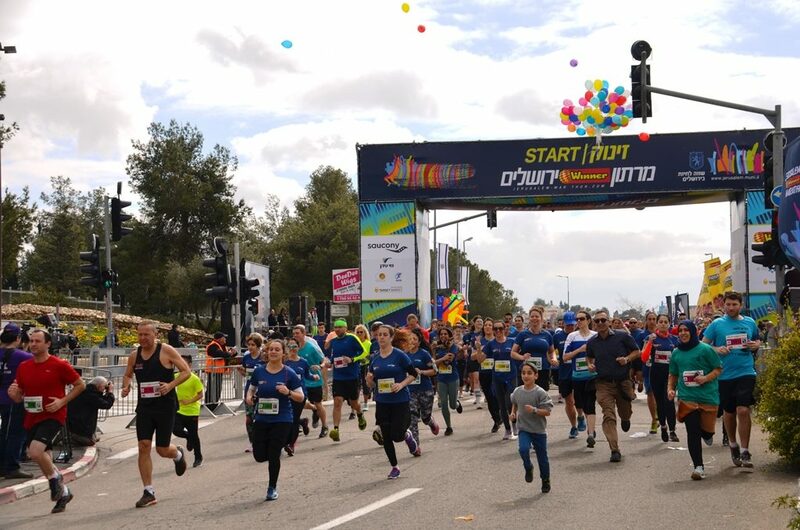 Thousands waited for their starts, over and over, every 15 minutes for the 10K races. There was also a special 5K track for a family friendly, slower paced walk. 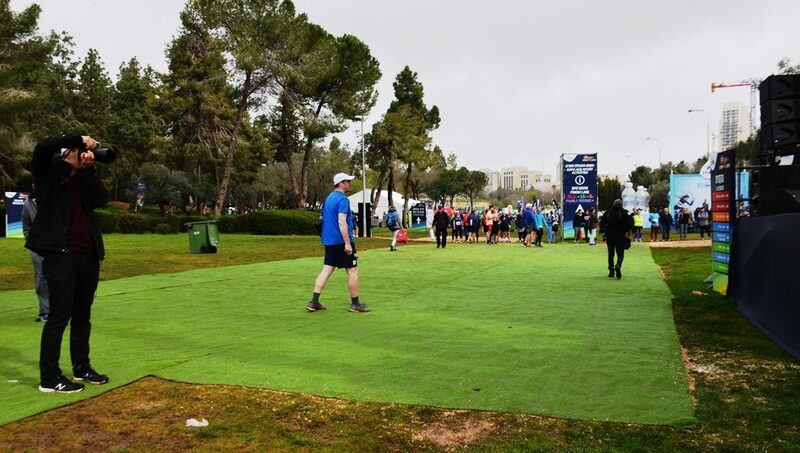 The finish line for the 10K runners was impressive. People were pushing baby strollers. 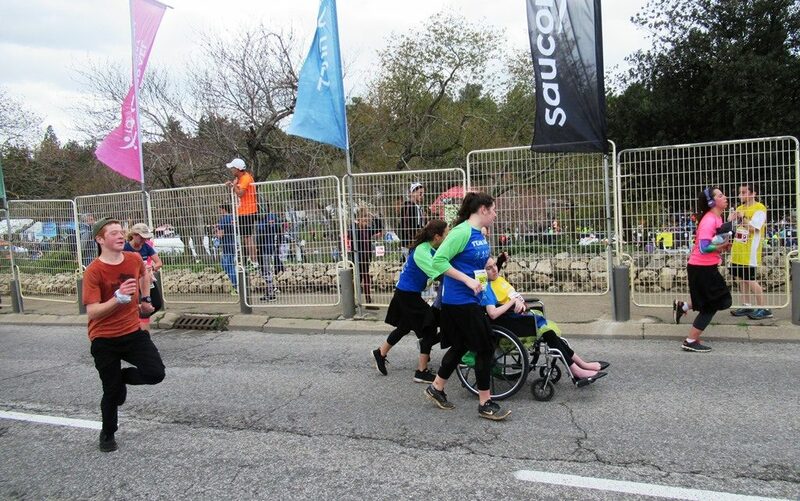 Also there were runners pushing wheelchairs in various races. 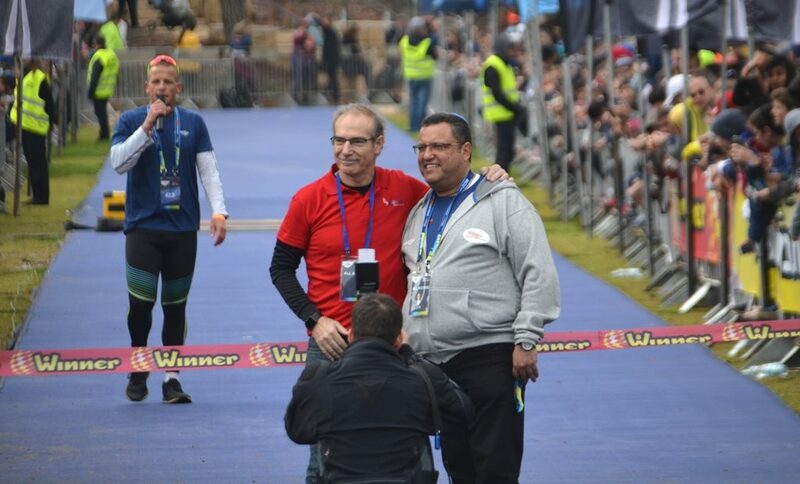 Seems each year, one person I find at start and finish. 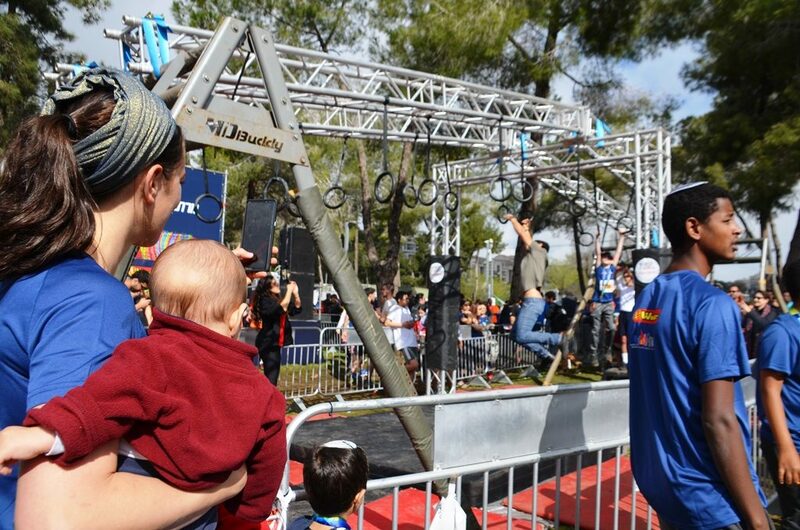 I was not looking for him this year, but there was Nir Barkat. Runners were still arriving as people were slowly walking home. 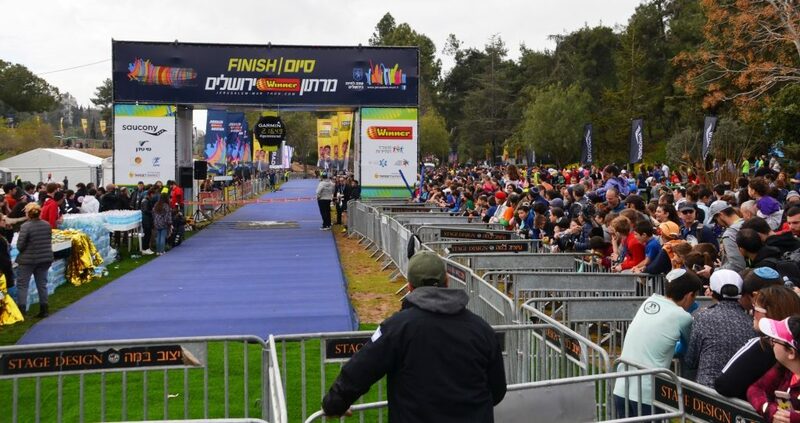 Full marathon runners were arriving to Gan Sacher on this newly finished path. 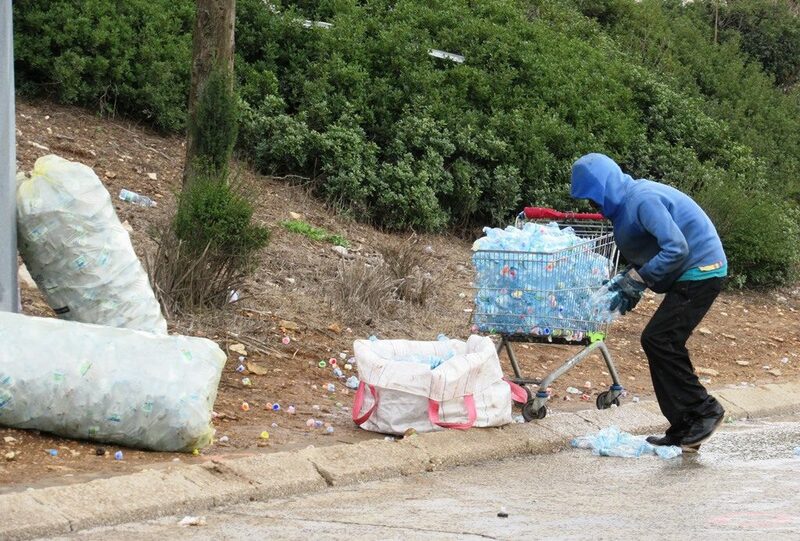 Hundreds of volunteers were cleaning up thousands of water bottles along the route. 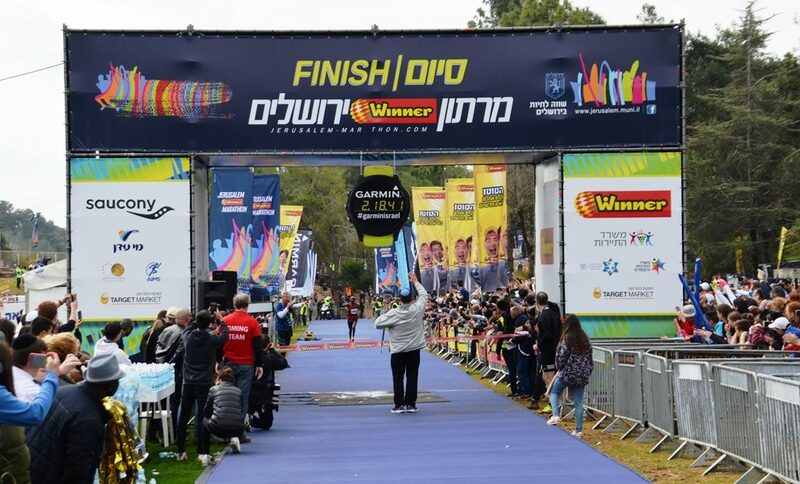 The Jerusalem Winner Marathon has become more than an annual sports competition. Each year I go back, and say I will take fewer photos, but do not succeed. Here are two examples of why I spend hours walking and sharing this event. One their way to the midday family run, I met up with one family. 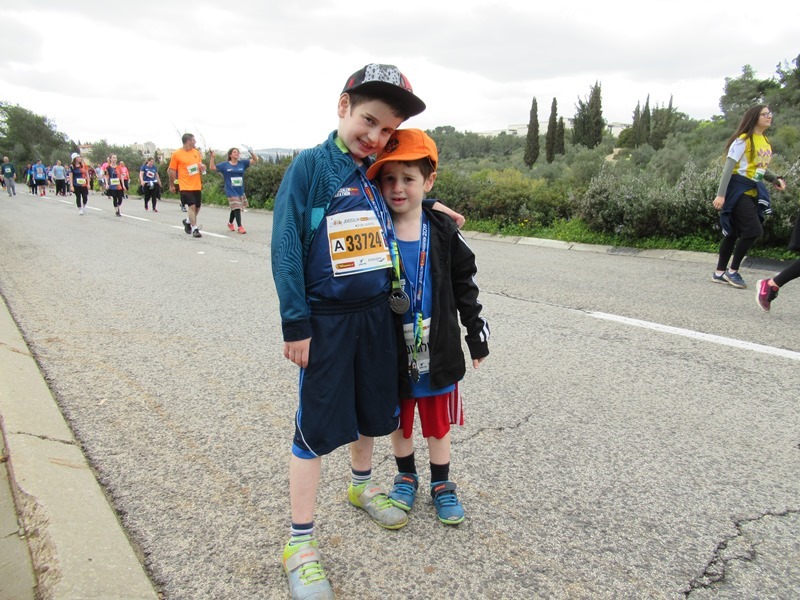 Big brother gave his medal for finishing the 5K run to his little brother. 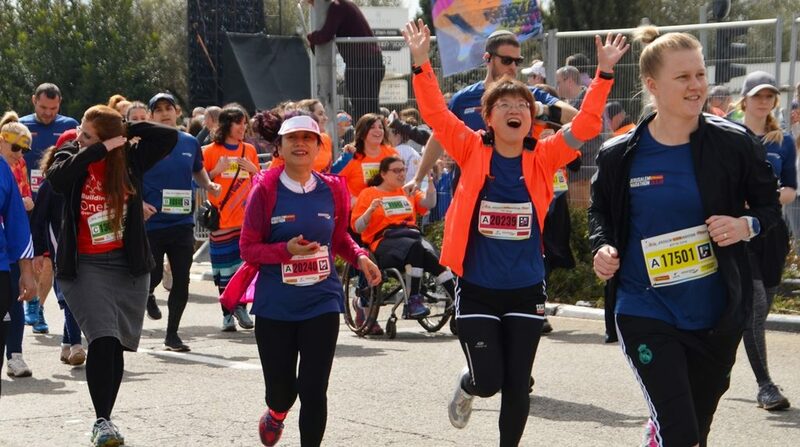 And with all the tens of thousands of runners at the finish line, some seem more special. Team spirit. Family spirit. A day of unity. 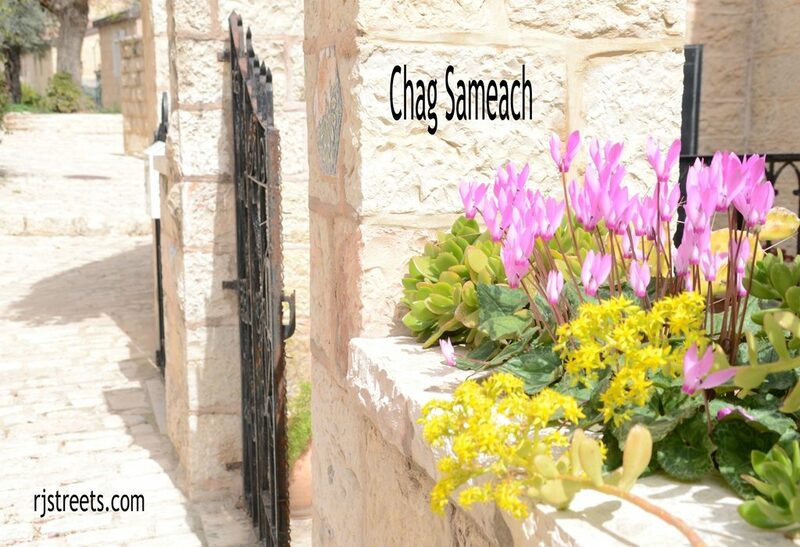 Am Yisrael Chai. Some smiles were more special than others, races were not about who came in first. 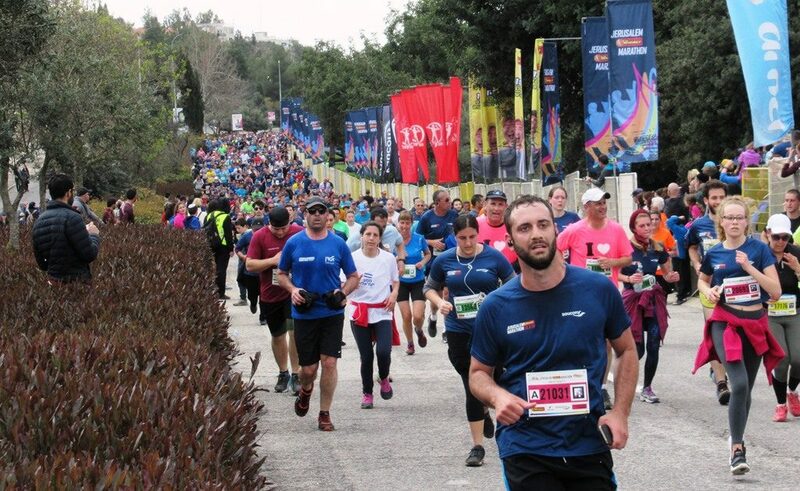 Finally – with posting this, my Jerusalem Marathon is over for this year. Now time to get ready for next marathon! Terrific as usual. Just one picture missing, Aryeh and Zahava!! A&Z are training for bigger races and did not run this year.